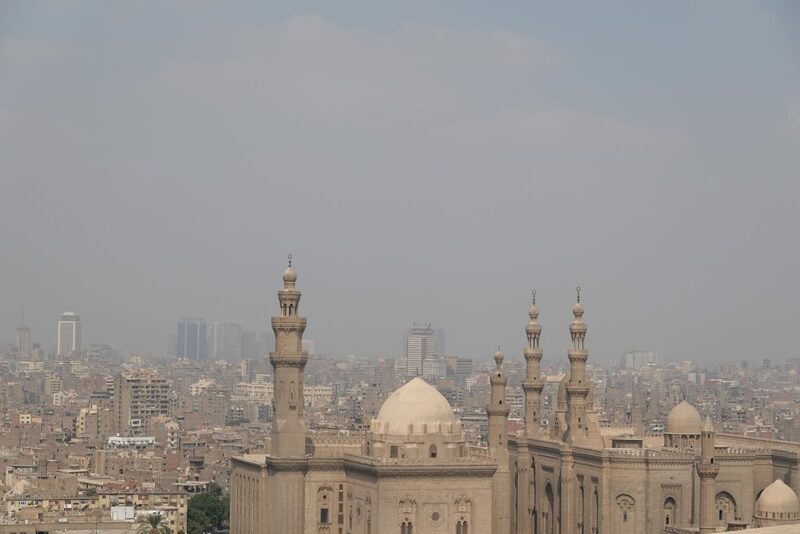 Modern Cairo, known as the Mother of the World, is a city of 19 million people and 2.5 million cars. 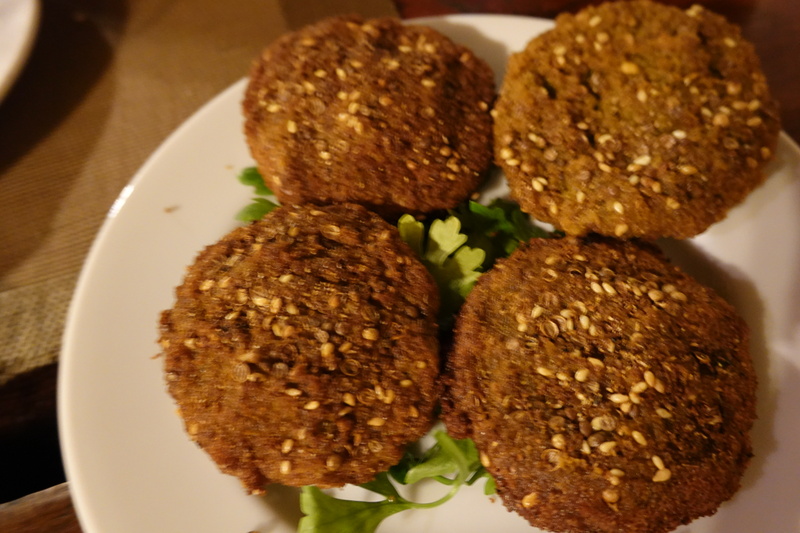 In the 900’s, Cairo, originally known as Fustat, was a key location in the spice trade. Many peoples and cultures formed modern day Cairo such as the Malmuks, the Ottoman Empire, Romans, French, and British. Pollution from Cairo’s cars and manufacturing hangs in the air. Memphis was the capital of the Old Kingdom. Sakkara was the burial site for deceased pharaohs and their families for more than 3500 years and Egypt’s largest archaeological site. Then it lay buried under sand for centuries. Step Pyramid of Djoser (the prototype for all future pyramids), 27th century BC. Notice the scaffolding on the side of the pyramid. This is an effort to preserve the oldest known stone structure . A British company was given the first contract, but the job was unsatisfactory. 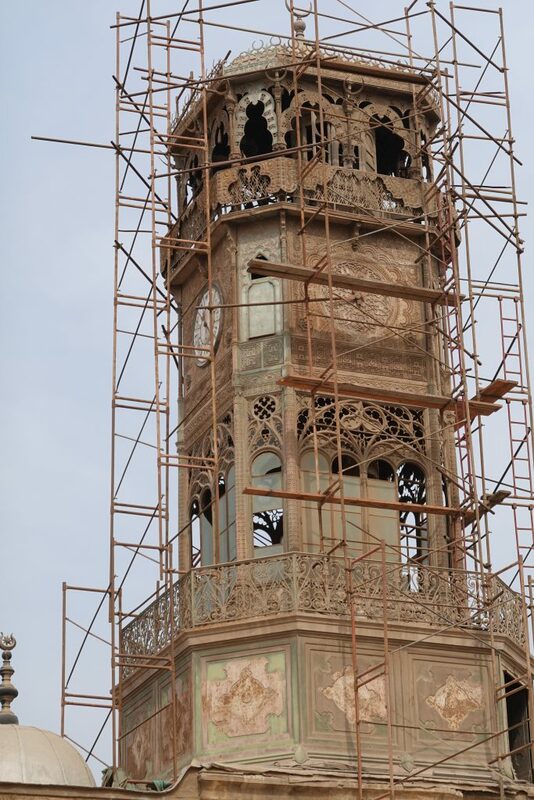 Now, an Egyptian company is working on the restoration. This innovative architecture employed by Imhotep was a deviation from previous burial tombs, which were underground rooms topped with mud brick called mastabas. Imhotep used six mastabas, each smaller than the previous one, resulting in the name “step” pyramid. The earliest stone monument in the world rose to a height of 197 feet (60 M). A limestone wall surrounds the burial site. Forty pillars line the entrance corridor crowned with columns that resemble bundles of papyrus stems. Hieroglyphs in TTi’s tomb. No glass covers the hieroglyphs or guards give you the evil eye. You are face-to-face with these ancient drawings. The colors, although faded, are still visible. I enjoy the freedom of access. Khufu is the oldest and largest of the pyramids (The Great Pyramid). 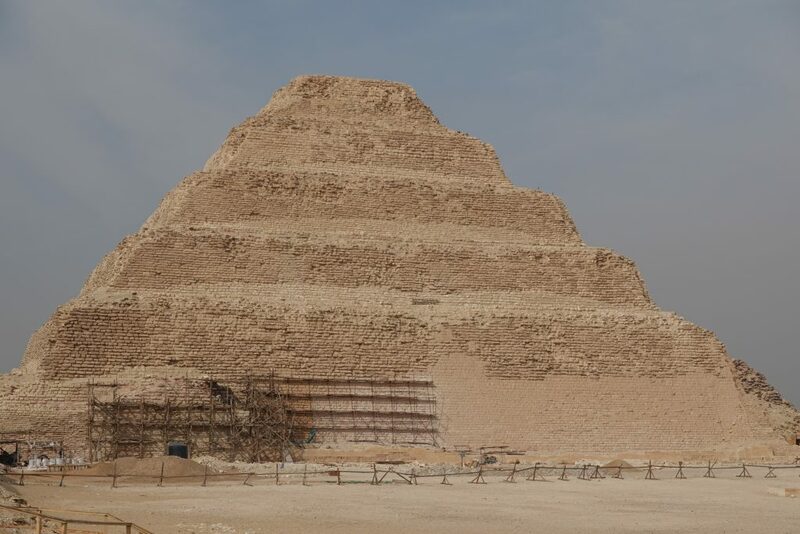 Built by King Khufu of the 4th Dynasty (2589-2566 BC). 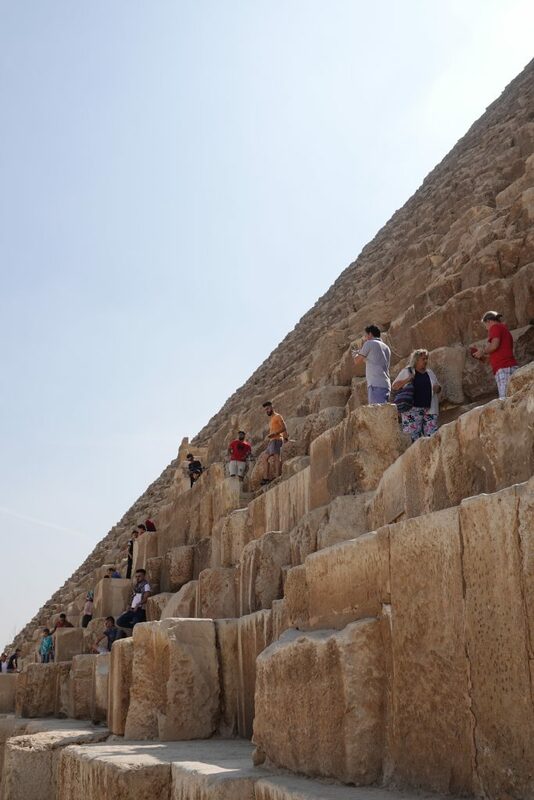 Two million blocks of stone comprise the 475 ft (146 M) Pyramid. People climbing on the Khufu Pyramid. No restrictions. For 300 Egyptian Pounds you can enter the pyramid. There is no longer anything left inside. The tomb has been vandalized a long time ago. Khafre’s (Kufu’s son) pyramid is 446 feet (136M high), slightly smaller than his father’s tomb. Menkaure pyramid is smaller than its neighbors. Whether the size reduction was because the king’s power was reduced or a change in priorities, is up to speculation. The Sphinx which guards the entrance to Khafre’s pyramid is the earliest known Egyptian monument, 2500 BC. Carved from an outcrop of rock, the Sphinx stands 66 ft. high. The Sphinx has lost several “parts” such as his nose and elongated beard. Additional problems of growing old are pollution and rishing ground water. You think you have problems, this old guy’s motto is patch, patch, patch. The Sphinx is one of the most recognized of the ancient Egyptian ruins. 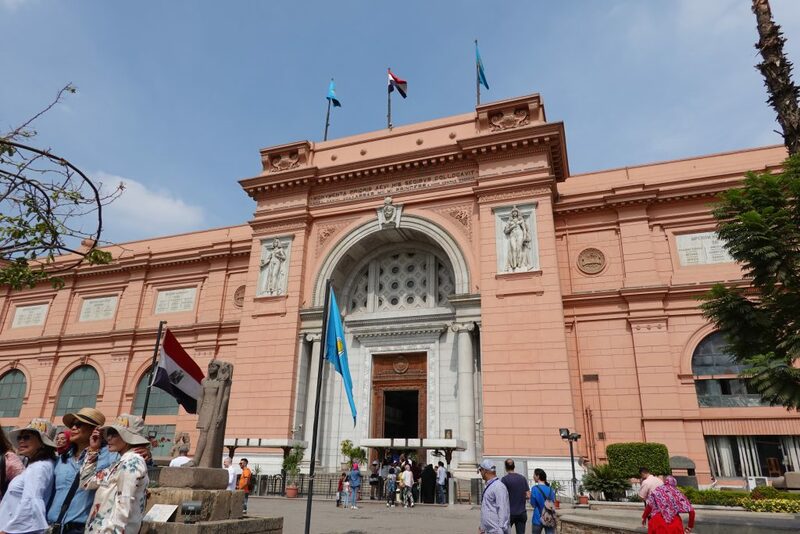 Cairo Egyptian Museum (opened 1902) contains 100,00 objects in 161,500 sq. Ft. (15,000 sq meters). Because the space can not accommodate the large collections, they are stored in the basement. For an extra 50 Egyptian Pounds ($2.80 US), you will receive a ticket which allows you to take photos. I happily paid the extra fee. View of entrance to the Egyptian Museum. The museum was actually founded by a Frenchman, Augusta Marietta. The most coveted collection of the museum is Tutankhamen Galleries. King Tut’s tomb was discovered by Henry Carter. When Carter and the workmen entered the tomb, they discovered a disorganized collection of items as shown in the photo below which hangs on one of the museum walls. Speculation as to why the room is so dissheveled was due to the King’s sudden death. X-Rays have shown that the cause of death was from an injury to one of his legs which apparently became infected. His burial had to take place much sooner than anticipated. The collection of items in the entry room of King Tut’s tomb. Carter realized that a wall separated this room from one to the right. 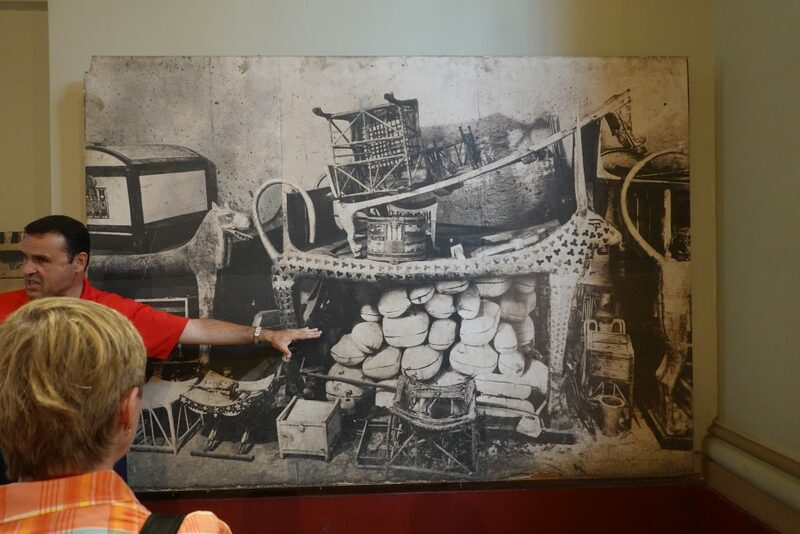 When he broke through to the next room, he found the multilayered boxes which contained the sarcophagus of Tutankhamen. 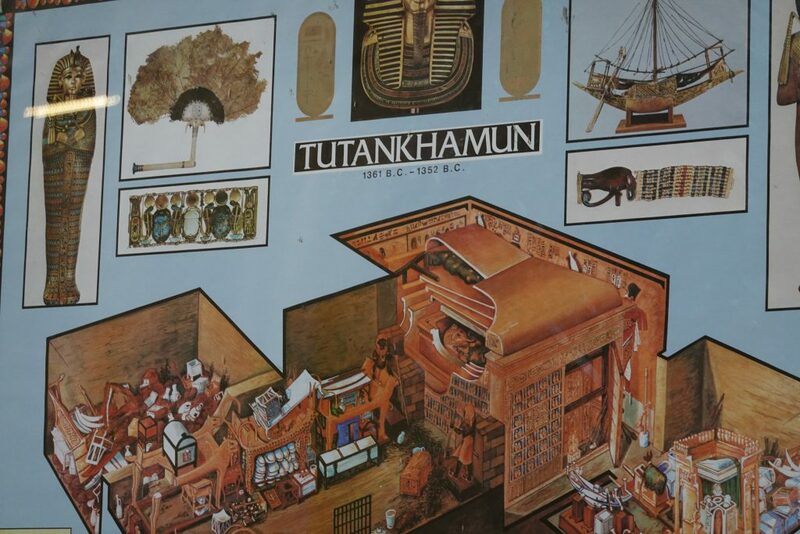 Artist rendering of the lay-out of Tutankhamen’s tomb. Known as the Boy King because he died at approximately 19 years of age. 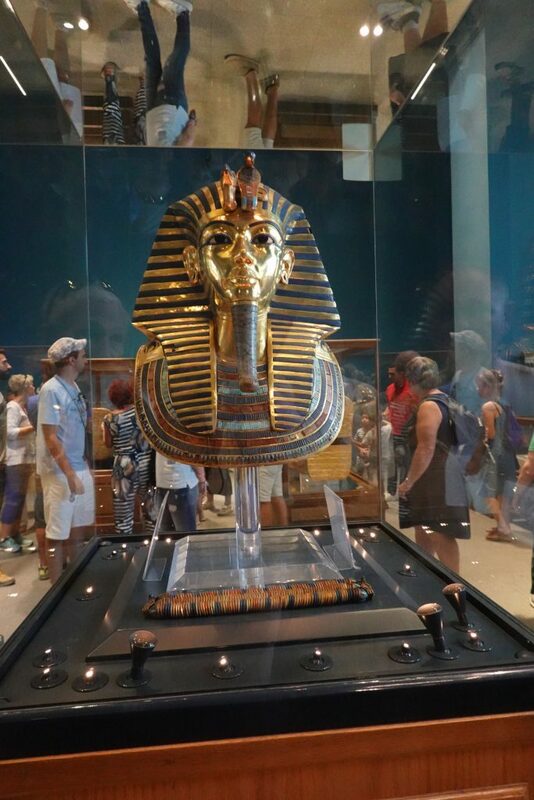 When the sarcophagus was opened, his mummified body was adorned with a mask made of solid gold and weighed 26 pounds. 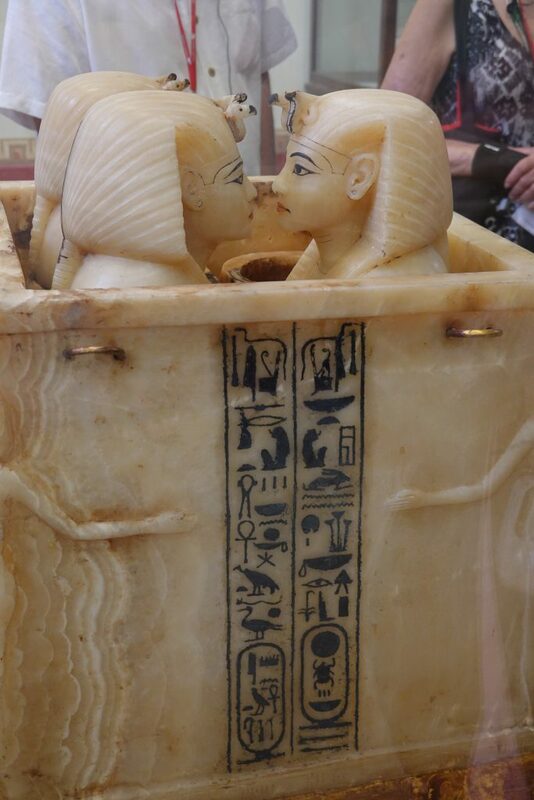 King Tut’s internal organs were placed in an alabaster chest of four Canopic jars, each jar with a stopper in the shape of Tutankhamen’s head. Canopic jars in which the King’s internal organs were placed. During the 2011 riots, thrives broke into the museum and stole about 37 items. Most of these have since been recovered. This robbery caused the museum to improve security. However, when you walk through the museum, you notice the antiquated cases and suffer the lack of AC/ventilation. Egypt desperately needs a more modern national museum. There is a new museum being built called Grand Egyptian Museum (GEM), but it has been the victim of graft and corruption from the Mubarak administration. The GEM was suppose to open in 2018, but because of people absconding with money earmarked for building the new facility, the revised opening date is 2020. 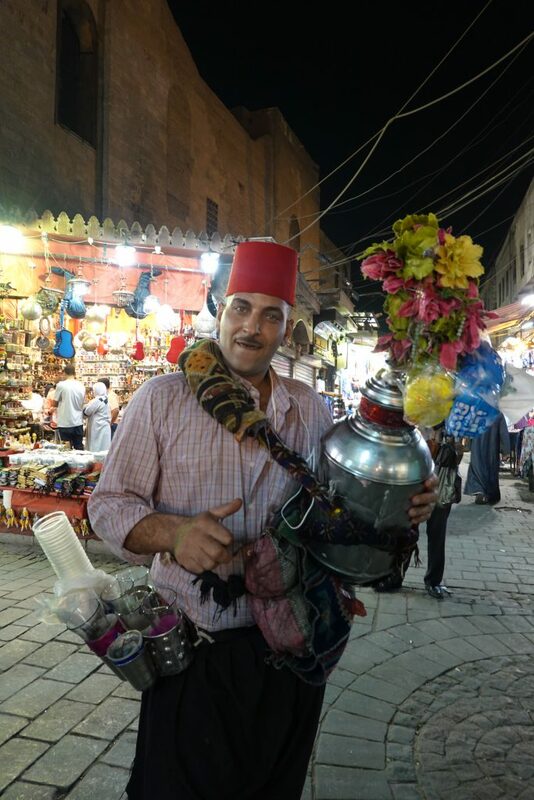 Mohammed Ali (an Albanian) is considered the founder of modern Cairo. He had the mosque constructed in the mid-19th century. 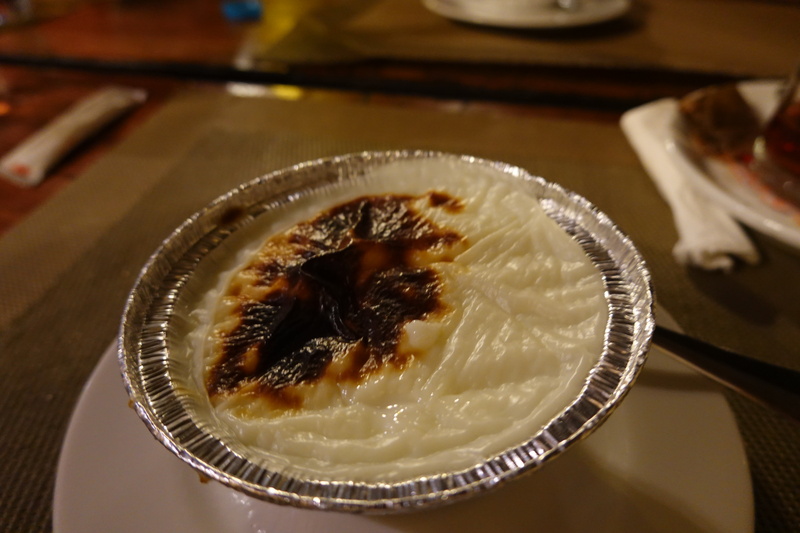 The architecture resembles that of those in the Ottoman Empire. There is a central dome and two slender minarets. The original design was for four minarets. Money was the issue. 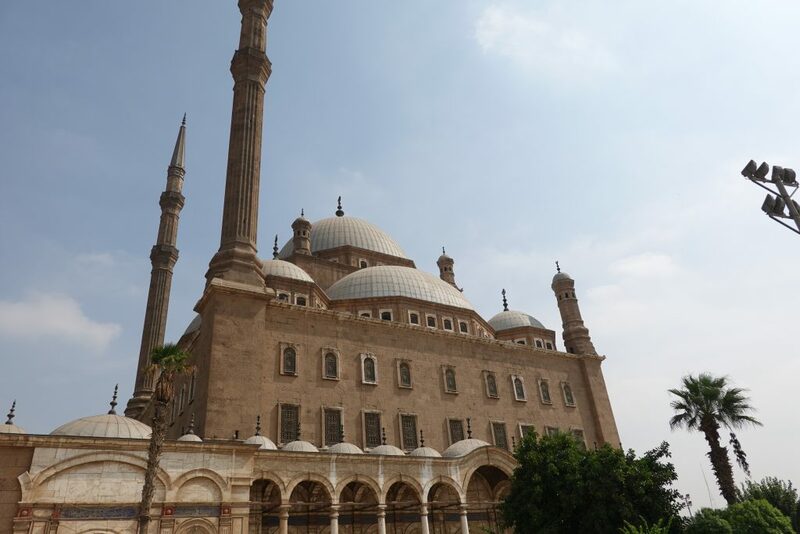 Mohammed Ali Mosque with a central dome and two minarets. The clock, located next to the courtyard, was a gift to Mohammed Ali from French King Louis-Philippe. Ali had given the king an obelisk which now stands in the Place de la Concorde. Unfortunately, the clock was damaged in shipment and has never worked. Clock, a gift from King Louis-Philippe to Mohammed Ali. But, the clock was damaged in transit and has never worked. 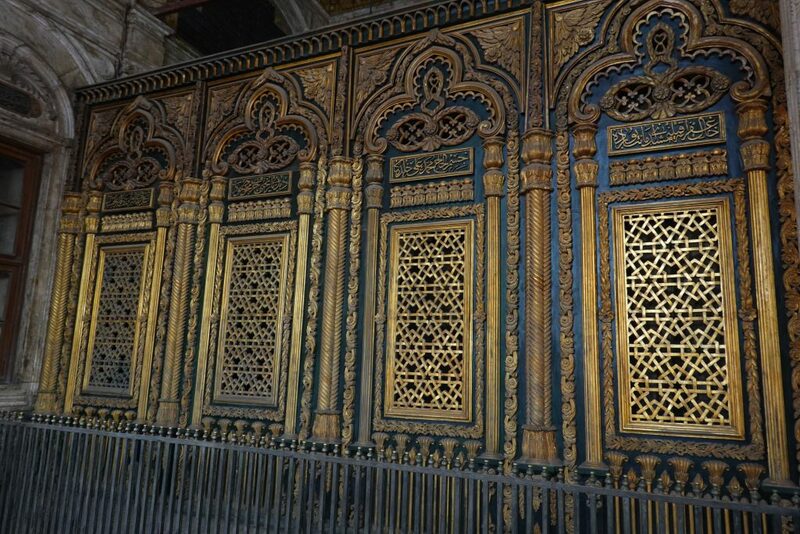 The marble tomb of Mohammed Ali which is located to the right of the entrance of the prayer area. Huge. This is one of the largest bazaars in the Middle East. Trinkets sparkle in the sunlight. 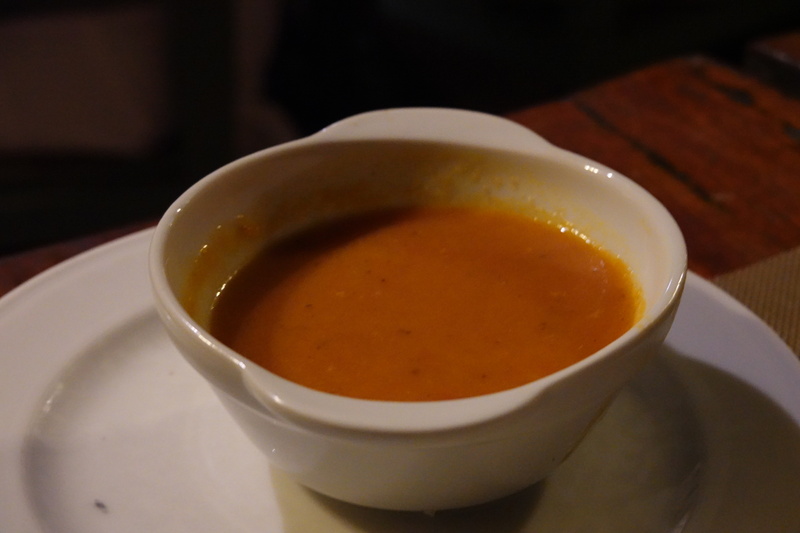 The smell of spices fill the air. In the beginning, the buildings you see in the background were warehouses for merchants to store their products. 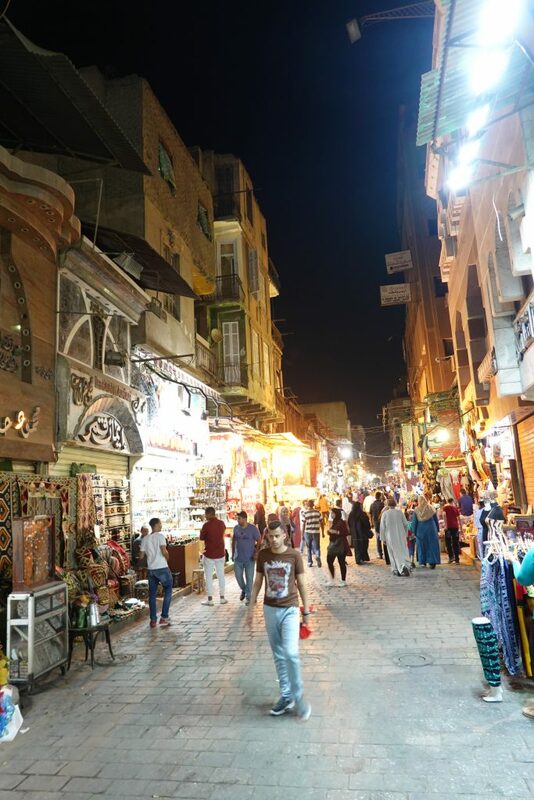 View of the Main Street of Khan el Khalili during the evening market. 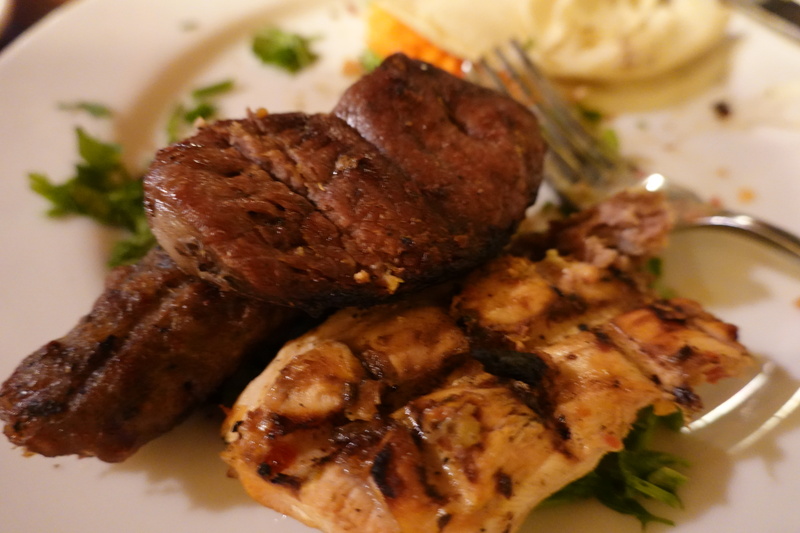 Turkey had a strong influence on the type and taste of Egyptian food. 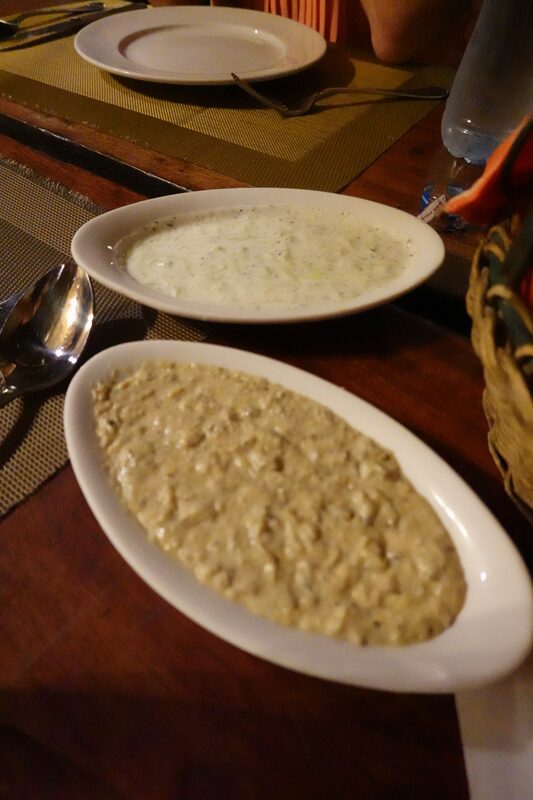 Here are some examples from a local restaurant. 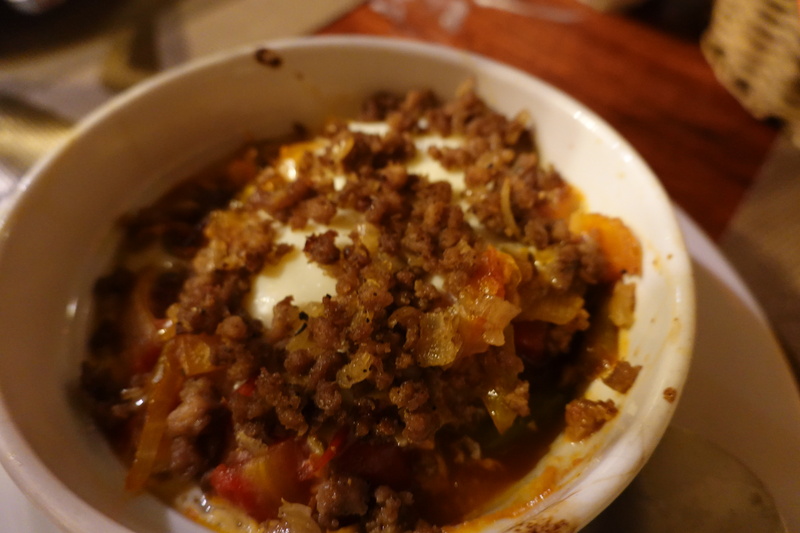 Shakshouka, poached eggs, onions, and chilies. 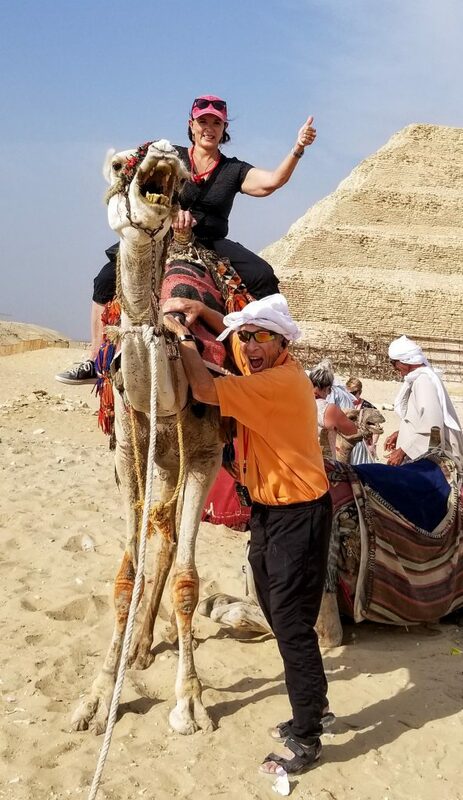 More to come in a few days on pyramids and pharaohs. It’s off to Luxor in the morning and the Valley of the Kings.